Keep in mind that this is a list for single Canada stamps. No pairs, blocks or Provincial issues (they will be the subject of another article). Also, there are often several specimens of these stamps available in different conditions, I have tried to find the stamp that got top dollar at auction. Hope you find one in your collection!! note: The images are not necessarily those of the exact stamp sold for the reported price, but a specimen for reference purposes. One of Canada’s first stamps, this specimen once sold for $120 000 in May 2014; a specimen from the Outaouais Collection was recently sold in September 2017 for $66 000. Issued in 1851 and designed by Sandford Fleming, most stamps of the time featured the reigning monarch, but Canada’s first stamp proudly displayed an engraving of a beaver by a river. In fact, it is the first official stamp in the world to be issued with an animal on it instead of a person. Also known as the «Black Empress», a Mint OGNH version of this stamp sold a few years ago at auction for $425 000 in January 2011. A few years earlier, another version of the stamp fetched $273 000.
see article: Rare Canadian stamp gets top dollar at auction! It is thought that only a few hundred of these 2¢ Large Queens were accidentally printed on laid paper (all the other issues were printed on wove paper). Out of these few hundred stamps, the first seems to have been noticed in 1925. There are three known specimens of this stamp. 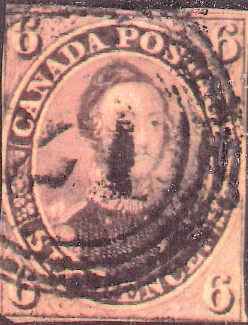 One of them brought in $475 000 at auction in February 2014.
see article: Brigham Auctions just sold the rarest stamp of Canada! and New rare Canada stamp discovered!